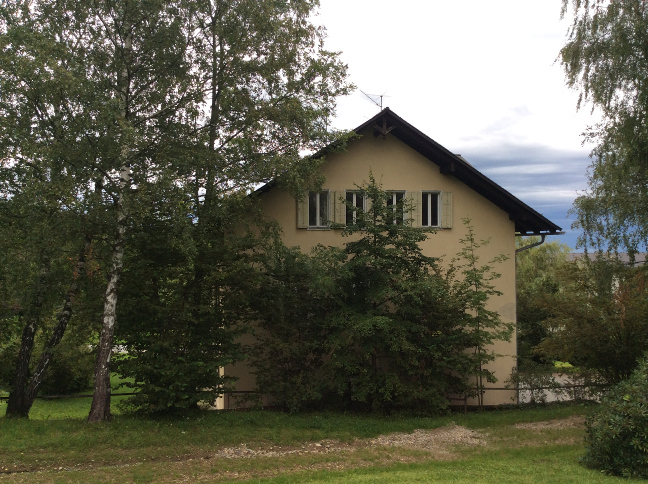 Yeshe Sal Ling Bön center at Kurweg 2, 8061 Sankt Radegund bei Graz, can accommodate up to 12 people in 4 to 7 rooms. Staying in Yeshe Sal Ling, you enjoy frequent interactions with the resident Lama, and it's only a few meters from your bed to the location of teachings and meditations. Note, however, that the people staying in the house at any one time form a temporary household, in which everybody has to participate in the household chores, such as dish washing and cleaning. Volunteers who do cooking, cleaning and maintenance work (in a more substantial way than mere participation in household chores as mentioned above) will have priority for accommodation in Yeshe Sal Ling itself. To inquire about staying at Yeshe Sal Ling, send email to yeshesalling@disroot.org (Simon) well in advance. At the time of teachings, the few rooms and beds are booked out early. During teachings, most rooms will be used as double rooms or small dormitories with 3 people per room, but one or two single rooms might be available. During less busy times, rooms can be booked as single rooms for longer personal retreats. Two of the rooms are equipped for use as dark rooms. Because of zoning regulations (we are in the neighborhood of a rehab clinic), camping in the garden of Yeshe Sal Ling is not possible. Also, Ms. Lammer, the proprietor of of the bowling alley "Alle 9e" in the center of Radegund might have (somewhat spartan) rooms to let. ph: +43 664 - 89 81 862, 10 min walk to Yeshe Sal Ling. Among the many B&Bs and inns listed (as of Dec 2018) on the above websites, only Kirchenwirt, Seirer and Freiinger, and Ms. Lammer's private rooms are in easy walking distance of Yeshe Sal Ling. Gasthof Budapest is closed, unfortunately. Be warned that places with addresses "am Schöckl" (in particular, Stubenberghaus and Alpengasthof) are on the plateau of Schöckl mountain and can be reached from Yeshe Sal Ling only by a strenuous hike (approx. 2 hours, hardly practicable in the dark) or by cable car. The cable car Schöckl-Seilbahn operates from 9am to 4:30pm in winter and from 9am to 5pm in summer. The closest camping site, next to a swimming pond, is at "well welt" in Kumberg about 8km south-east of St. Radegund bei Graz. (Not well conected to Yeshe Sal Ling by public transportation). See also this "camping guide".